AAA (2) Alkaline battery is standard power source, Ni-MH battery can be installed as optional choice. LEL monitoring for gas pipeline installations. LEL & CO monitoring while checking or installing gas meters. 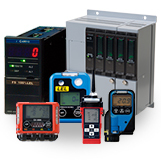 O2 & H2S monitoring while working in tanks, pits, or other confined spaces. CO monitoring in iron and steel plants. H2S monitoring around oil fields, refineries, petrochemical.